The main duty of a Safety Administrator is to see that the working and non-working area of the organization is kept hazard-free to get maximum efficiency and to provide safety to the employees and Clients. 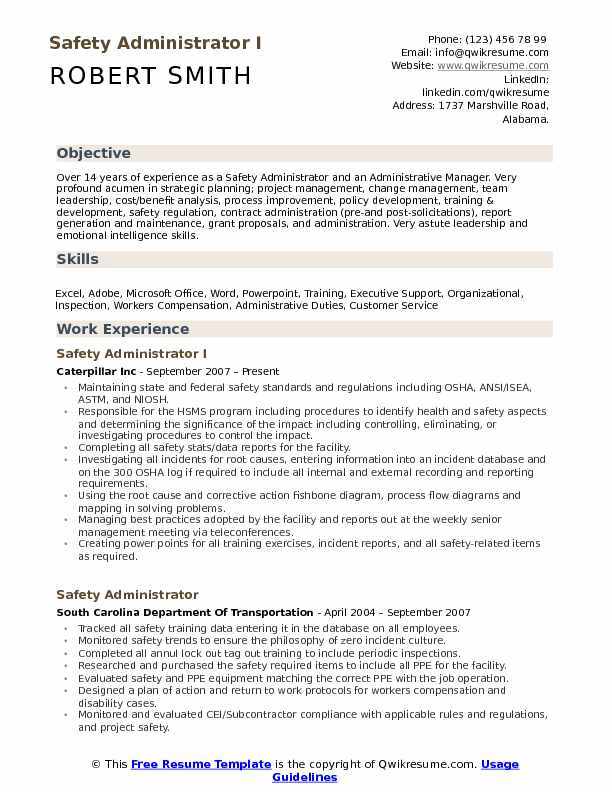 The major roles and responsibilities that are listed on the Safety Administrator Resume include – conducting safety checks periodically, locating unsafe equipment or procedure, noting such things and informing to the upper management, taking steps to mitigate risk if any, conducting safety drills, and training employees on how to deal in case of emergencies. 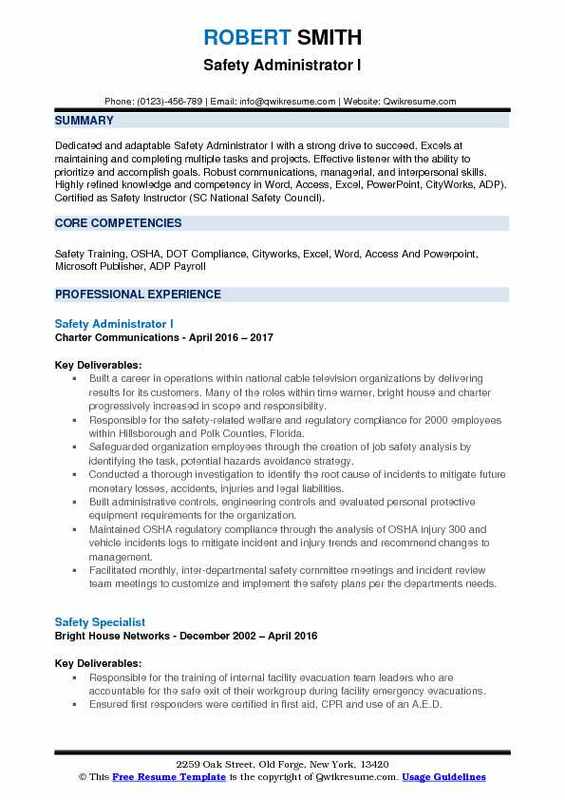 Candidates looking for an entryway into this safety profession should demonstrate these skills in the resume – strong communication skills, ability to create safety manuals, the ability to act quickly in case of emergencies, training skills, and staying abreast of current occupational legislation and requirements. While an entry-level position may need only a GED or a high school diploma, higher level safety officers need extra qualifications and experience. 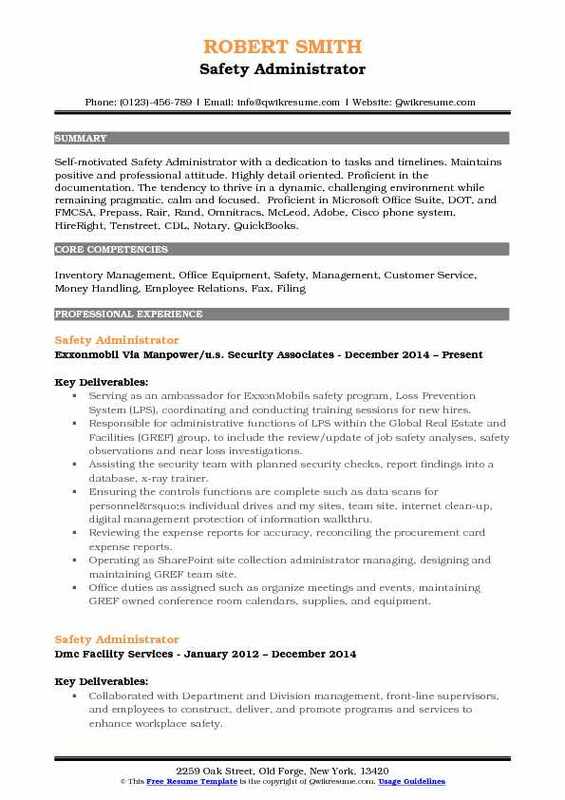 Summary : Over 14 years of experience as a Safety Administrator and an Administrative Manager. Very profound acumen in strategic planning; project management, change management, team leadership, cost/benefit analysis, process improvement, policy development, training & development, safety regulation, contract administration (pre-and post-solicitations), report generation and maintenance, grant proposals, and administration. Very astute leadership and emotional intelligence skills. Maintaining state and federal safety standards and regulations including OSHA, ANSI/ISEA, ASTM, and NIOSH. Responsible for the HSMS program including procedures to identify health and safety aspects and determining the significance of the impact including controlling, eliminating, or investigating procedures to control the impact. Completing all safety stats/data reports for the facility. Investigating all incidents for root causes, entering information into an incident database and on the 300 OSHA log if required to include all internal and external recording and reporting requirements. Using the root cause and corrective action fishbone diagram, process flow diagrams and mapping in solving problems. Managing best practices adopted by the facility and reports out at the weekly senior management meeting via teleconferences. Creating power points for all training exercises, incident reports, and all safety-related items as required. 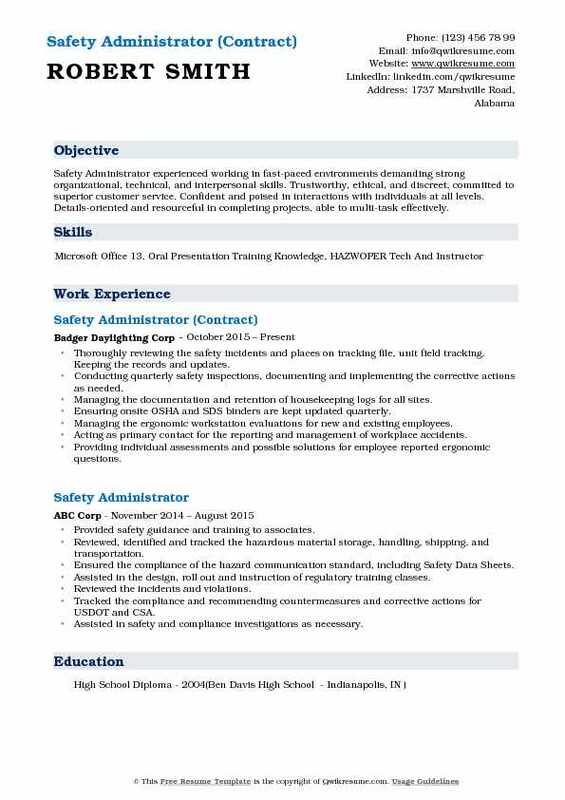 Summary : Dedicated and adaptable Safety Administrator I with a strong drive to succeed. Excels at maintaining and completing multiple tasks and projects. Effective listener with the ability to prioritize and accomplish goals. Robust communications, managerial, and interpersonal skills. Highly refined knowledge and competency in Word, Access, Excel, PowerPoint, CityWorks, ADP). Certified as Safety Instructor (SC National Safety Council). Built a career in operations within national cable television organizations by delivering results for its customers. Many of the roles within time warner, bright house and charter progressively increased in scope and responsibility. Responsible for the safety-related welfare and regulatory compliance for 2000 employees within Hillsborough and Polk Counties, Florida. Safeguarded organization employees through the creation of job safety analysis by identifying the task, potential hazards avoidance strategy. Conducted a thorough investigation to identify the root cause of incidents to mitigate future monetary losses, accidents, injuries and legal liabilities. Built administrative controls, engineering controls and evaluated personal protective equipment requirements for the organization. Maintained OSHA regulatory compliance through the analysis of OSHA injury 300 and vehicle incidents logs to mitigate incident and injury trends and recommend changes to management. Facilitated monthly, inter-departmental safety committee meetings and incident review team meetings to customize and implement the safety plans per the department's needs. Summary : Safety Administrator experienced working in fast-paced environments demanding strong organizational, technical, and interpersonal skills. 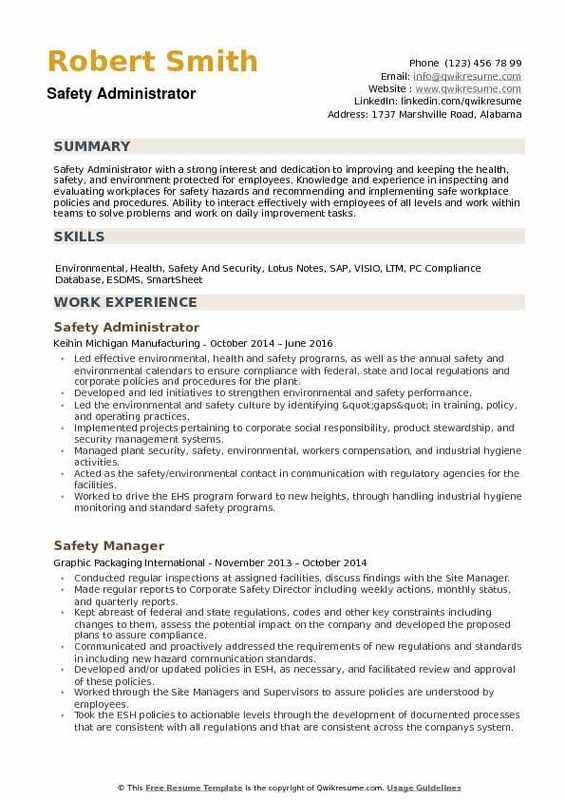 To obtain a position that allows me to utilize my previous safety, human resources, recruiting and managerial skills within an organization where advancement is based on personal performance. Responsible for handling all workers compensation claims, accompanying employees to all doctor visits, filing and managing insurance claims, and mitigating legal actions to minimize overall cost/exposure. Partnering with the medical providers to exhaust all first aid methods to minimize recordable incidents. Filing and maintaining 3rd party, auto, GL, and theft insurance claims for the organization from the first report to closure by working with the adjustors and internal staff weekly. Conducting the weekly field job site observations and conducting safety audits. Maintaining all OSHA logs and reporting annual recordable injuries to the state. Submitting the quarterly MSHA hours for each sand plant/mine, reporting any injuries when necessary, and submitting the updated training plans for approval when changes are made to MSHA. Participating in the office safety committee and safety leadership program. Trend and monitoring all incidents from property damages, dot inspections, and injury demographics to assist in creating policy improvements and develop risk reduction practices to increase safety awareness and minimize future risk. Objective : Trustworthy, ethical, and discreet Administrator committed to superior customer service. 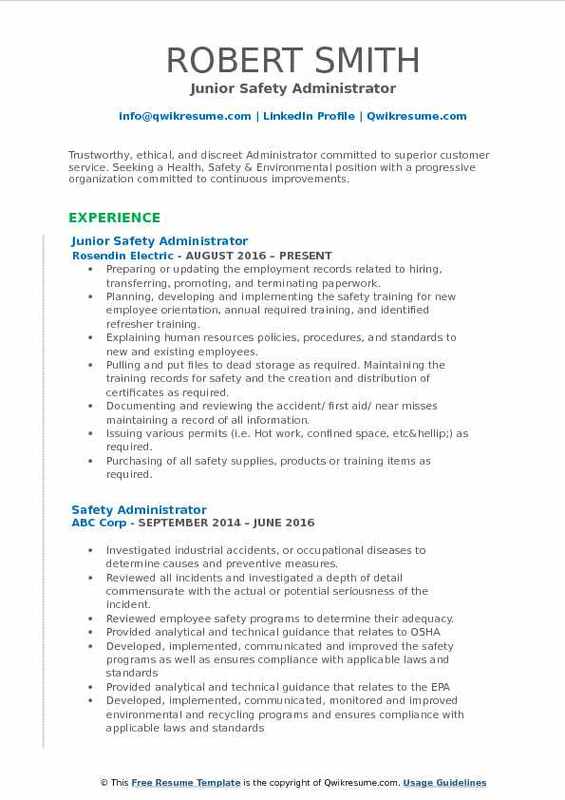 Seeking a Health, Safety & Environmental position with a progressive organization committed to continuous improvements. Preparing or updating the employment records related to hiring, transferring, promoting, and terminating paperwork. Planning, developing and implementing the safety training for new employee orientation, annual required training, and identified refresher training. Explaining human resources policies, procedures, and standards to new and existing employees. Pulling and put files to dead storage as required. Maintaining the training records for safety and the creation and distribution of certificates as required. Documenting and reviewing the accident/ first aid/ near misses maintaining a record of all information. Issuing various permits (i.e. Hot work, confined space, etc…) as required. Purchasing of all safety supplies, products or training items as required. Maintaining records related to grievances, performance reviews, and disciplinary actions. Verifying timekeeping records and consult employees about any discrepancies. Recording the payroll data in our software system and verifying all amounts prior to cutting checks. 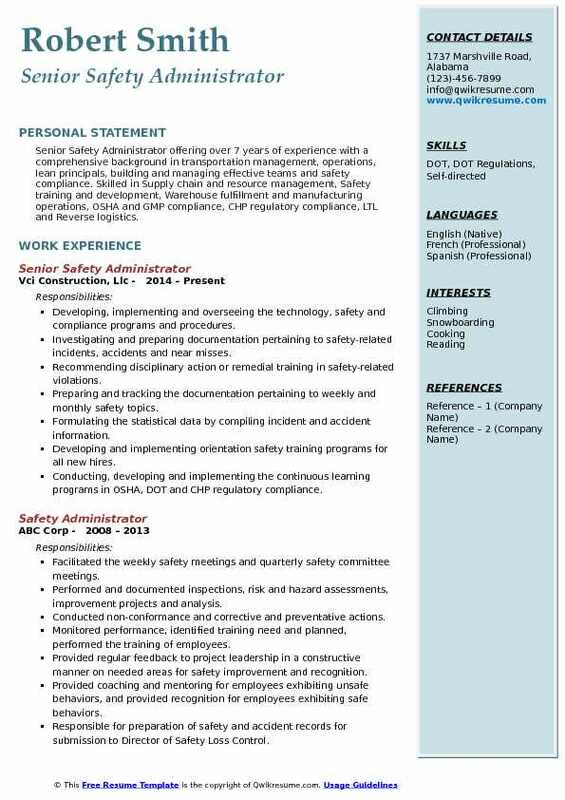 Summary : Senior Safety Administrator offering over 7 years of experience with a comprehensive background in transportation management, operations, lean principals, building and managing effective teams and safety compliance. Skilled in Supply chain and resource management, Safety training and development, Warehouse fulfillment and manufacturing operations, OSHA and GMP compliance, CHP regulatory compliance, LTL and Reverse logistics. Developing, implementing and overseeing the technology, safety and compliance programs and procedures. Investigating and preparing documentation pertaining to safety-related incidents, accidents and near misses. Recommending disciplinary action or remedial training in safety-related violations. Preparing and tracking the documentation pertaining to weekly and monthly safety topics. Formulating the statistical data by compiling incident and accident information. Developing and implementing orientation safety training programs for all new hires. Conducting, developing and implementing the continuous learning programs in OSHA, DOT and CHP regulatory compliance. Implementing and deploying the lean six sigma principles in areas of safety and production. Monitoring and maintaining the company safety performance within company objectives. Objective : Safety Administrator experienced working in fast-paced environments demanding strong organizational, technical, and interpersonal skills. Trustworthy, ethical, and discreet, committed to superior customer service. Confident and poised in interactions with individuals at all levels. Details-oriented and resourceful in completing projects, able to multi-task effectively. Thoroughly reviewing the safety incidents and places on tracking file, unit field tracking. Keeping the records and updates. Conducting quarterly safety inspections, documenting and implementing the corrective actions as needed. Managing the documentation and retention of housekeeping logs for all sites. Ensuring onsite OSHA and SDS binders are kept updated quarterly. Managing the ergonomic workstation evaluations for new and existing employees. Acting as primary contact for the reporting and management of workplace accidents. Providing individual assessments and possible solutions for employee reported ergonomic questions. Providing information to appropriate departments to ensure any changes implemented meet safety requirements. Responsible for filing and tracking Workers Compensation claims. 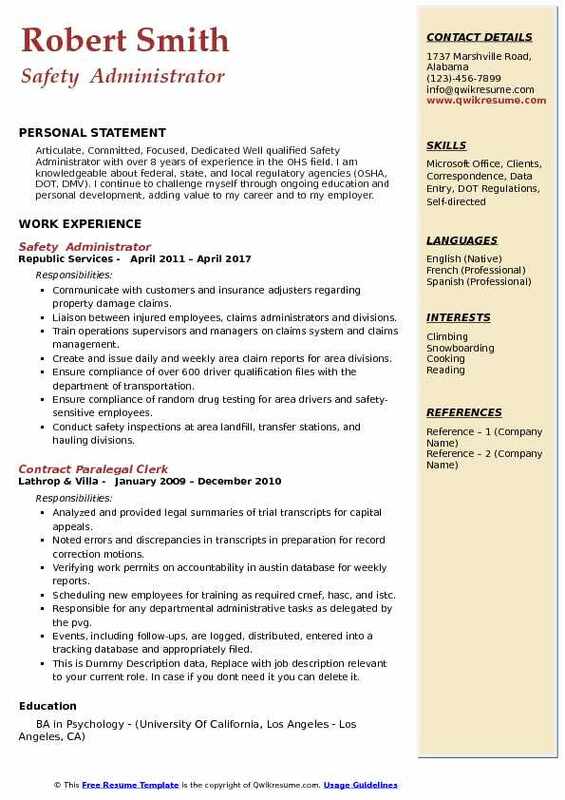 Summary : Safety Administrator with 9+ years of experience in office support, safety administration, and logistics seeking to continue my career with a progressive industry leading company. My strong organizational skills, proven history of thriving in fast-paced environments while exceeding goals will make me a great asset to your team. Ability Summary Exceptional at organizing tasks with multiple complexities and tight deadlines. Strong analytical and problem-solving abilities. Analyzed weekly, monthly, quarterly, and yearly safety statistics by area as a whole. Designed team participant for the current incident tracking system staff trainer. Tracked and recorded MSHA citations by mine and by area and provided numerous reports. Tracked safety meeting attendance for all employees via excel spreadsheet. Created forms and spreadsheets used throughout cliffs for safety department. Ordered supplies and created requisitions as needed for safety and EAP program. Gathered data, designed, and provided powerpoint presentations to upper management and corporate on a weekly, monthly, and quarterly basis. Supervised and directed the Field Safety Specialists to accomplish team goals and objectives. Ensured that all Team Members receive safety training prior to beginning work. Measured, audited and evaluated the effectiveness of hazard controls and hazard control programs. Headline : Self-motivated Safety Administrator with a dedication to tasks and timelines. Maintains positive and professional attitude. Highly detail oriented. Proficient in the documentation. The tendency to thrive in a dynamic, challenging environment while remaining pragmatic, calm and focused. Proficient in Microsoft Office Suite, DOT, and FMCSA, Prepass, Rair, Rand, Omnitracs, McLeod, Adobe, Cisco phone system, HireRight, Tenstreet, CDL, Notary, QuickBooks. Serving as an ambassador for ExxonMobil's safety program, Loss Prevention System (LPS), coordinating and conducting training sessions for new hires. Responsible for administrative functions of LPS within the Global Real Estate and Facilities (GREF) group, to include the review/update of job safety analyses, safety observations and near loss investigations. Assisting the security team with planned security checks, report findings into a database, x-ray trainer. Ensuring the controls functions are complete such as data scans for personnel’s individual drives and my sites, team site, internet clean-up, digital management protection of information walkthru. Reviewing the expense reports for accuracy, reconciling the procurement card expense reports. Operating as SharePoint site collection administrator managing, designing and maintaining GREF team site. Office duties as assigned such as organize meetings and events, maintaining GREF owned conference room calendars, supplies, and equipment. 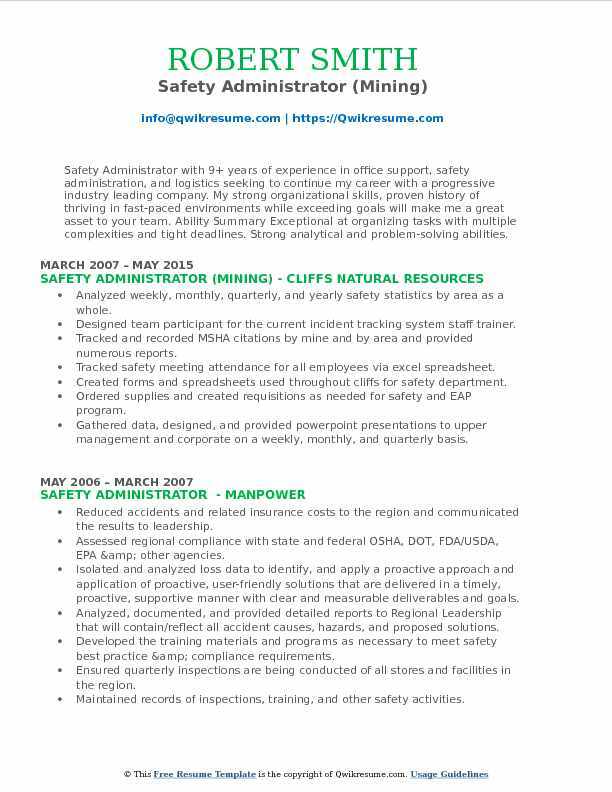 Summary : Articulate, Committed, Focused, Dedicated Well qualified Safety Administrator with over 8 years of experience in the OHS field. I am knowledgeable about federal, state, and local regulatory agencies (OSHA, DOT, DMV). I continue to challenge myself through ongoing education and personal development, adding value to my career and to my employer. Communicate with customers and insurance adjusters regarding property damage claims. Liaison between injured employees, claims administrators and divisions. Train operations supervisors and managers on claims system and claims management. Create and issue daily and weekly area claim reports for area divisions. Ensure compliance of over 600 driver qualification files with the department of transportation. Ensure compliance of random drug testing for area drivers and safety-sensitive employees. Conduct safety inspections at area landfill, transfer stations, and hauling divisions. Assist employees with human resource matters in the absence of human resources staff. Translate policies, programs, employee statements and safety alerts to spanish. 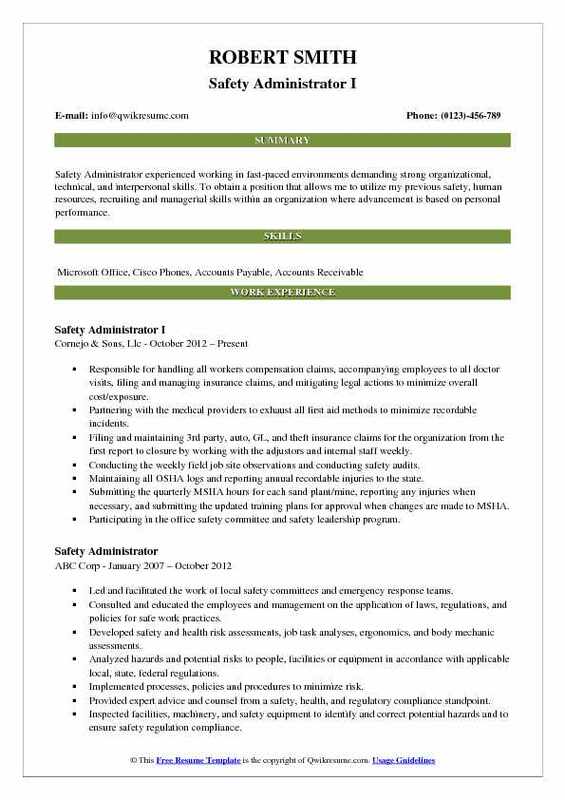 Objective : Safety Administrator with a strong interest and dedication to improving and keeping the health, safety, and environment protected for employees. Knowledge and experience in inspecting and evaluating workplaces for safety hazards and recommending and implementing safe workplace policies and procedures. Ability to interact effectively with employees of all levels and work within teams to solve problems and work on daily improvement tasks. Led effective environmental, health and safety programs, as well as the annual safety and environmental calendars to ensure compliance with federal, state and local regulations and corporate policies and procedures for the plant. Developed and led initiatives to strengthen environmental and safety performance. Led the environmental and safety culture by identifying "gaps" in training, policy, and operating practices. Implemented projects pertaining to corporate social responsibility, product stewardship, and security management systems. Managed plant security, safety, environmental, workers compensation, and industrial hygiene activities. Acted as the safety/environmental contact in communication with regulatory agencies for the facilities. Worked to drive the EHS program forward to new heights, through handling industrial hygiene monitoring and standard safety programs. Ensured open items are being addressed, developing loss source trend information. Ensured safety/environmental training programs are designed, implemented, and conducted as required.